When looking at a foreclosure, or at a home where the appliances have not been switched out, I find signs of grease fires. Often these may not be dangerous, but you can take steps to avoid them, since these fires can go out of control. A very long time ago, when my wife and I first married, we were strolling through our apartment complex. As we approached one unit, I saw the flames begin to fly out of th pan. The two women in the kitchen stood there, frightened, not knowing what to do. I calmly walked over to them saying that they should cover the pot. The lack of air for the fire will smother it. They did as I told them, and the fire was quickly out. Having worked in food service, I saw many fires flare in the kitchen. I also witnessed people panicking, which is why I think that some fires become larger. I have hardly ever used a fire extinguisher in the kitchen, although I do not think that it is a bad idea to have one. However, please note that fire extinguishers have to be maintained; they usually require yearly service to keep the charge. Probably the best option is avoiding the situation of a grease fire altogether. What causes the grease fire? You have oil, grease, or fat coming into contact with a hot surface. If you stopped for a moment, you would quickly realize that there are many hot surfaces in your kitchen. We do not need the grease to come in to contact with a heating element from an electric or gas burner for the oil to combust; we only need a very hot surface. The interior of an oven that has been left on. A heating skillet, pan, or pot is the most common hot item for grease fires. If you watch a cooking show, they tell you to heat up the pan. Many of us have life to get in our ways, so we get back to the pan to late. Do not touch the pan, but hover your hand over it. If the heat is so intense that you have to remove your hand after three seconds, you have a very hot pan. Your options depend upon what you are cooking. First option, take the pan off of the heat to let it cool down. Second option, place the item being cooked into the pan, and then drizzle the oil over that item. For example, popcorn kernels can go into the pan first, and then the oil. This can work with meat as well. The food cools down the pan for the oil. Other hot surfaces can be the plate surrounding or under your burner; the lid of a pot or pan on the burner; the exterior parts of cooking equipment may be an issue (my toaster becomes quite hot); or a pan that is no longer on the burner and the food has been removed. What can be the source of the grease? The oil being used for cooking is the most obvious. I saw one cook with a plate of melting butter for a dish right next to the burner. Soup stock that is using a meat. If you have not skimmed the broth of the fat on top, you can be building up grease. I have seen grease that fell into the tray under the burner from a previous cooking time, ignite when I turned on the burner to test it. Keeping oil away from a hot surface is simple (you have to stop and think about what you are doing), but you should be in the practice of cleaning the kitchen after you have prepared the meal. 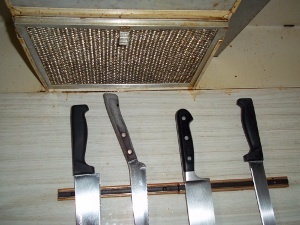 This is common in professional kitchens, because they are thinking about food safety. Cleaning after the meal preparation rids the surfaces of grease though. (I tell homeowners that you do not have to go through special steps with your home before an inspection, but I am surprised by the state of many kitchens that I am inspecting). Another source for grease fires is pictured below. The range hood can be a source of grease fires. The range hood serves a few functions in the kitchen. Most of us think that it is meant for ridding the home of cooking smells. Alright, it may accomplish that goal, depending on the type of range hood that you have. The main function of the range hood should be to rid your home of moisture from the cooking process. If you have a recirculating type (a unit that blows the air taken from the cooktop back into the house), you need to open a window to vent the moisture from cooking. The next function of the range hood is to remove grease from the air. Small bits of grease will travel up into the air with the moisture. With the fan on, the range hood takes this air, passing it over a filter, and then out of the unit. The filter catches the grease, but many people forget to clean it. These are wire mesh filters that either slide into place over the fan, or they clip into an opening which leads to the fan. You can wash the filter like you would your dishes. What happens on the filter is a build-up of grease can drop like moisture that is collecting on a leaf. Once the grease drops, it can hit the hot surface. 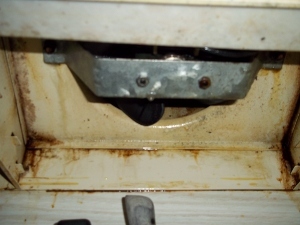 I have also seen grease collect on the other surfaces of the range hood, so wiping this appliance down is a good idea. Lastly, a word of advice about a range hood, they often have a light for the cooking surface (I would say always, but you do have different types of range hoods). Make sure that this light is covered. If the light explodes, you will have that glass and other substances in your food. Throw out the food; you do not know what may have dropped into it. To end, let us look at putting out fires in the kitchen. If you do use the fire extinguisher, throw out the food, and clean the kitchen well. The fire extinguishers is smothering the fire, and those chemicals can fly about. If you have a cover, leave the cover on for a minute. Turn off the heat, and then clean up once the stove has cooled down. You should be covering with an item that will not burn. If you are inspired by the movies, a blanket or towel will work; it has to be wet, and do not hit at the fire constantly. You need to deprive the fire of oxygen. Better than the blanket or towel would be salt. Salt will soak up the grease and help smother the oxygen of the fire. Here is to hoping that you do not have a fire. This entry was posted on Monday, March 7th, 2011 at 3:00 pm	and is filed under Home Maintenance-Consumer Info. You can follow any responses to this entry through the RSS 2.0 feed.